Shares of AudioCodes shot higher by over 12% on Monday after posting impressive quarterly earnings results. The company has posted 50% or better earnings growth over the last 5 quarters while maintaining consistent double digit sales growth over that time. The stock boasts a 98 EPS Rating, 97 Composite rating and 98 Relative Strength Rating while sporting a 37% Growth Rate. Clients were alerted to buy on 1/10 off of a double bottom breakout pattern and have locked in swing gains of close to 10% and are now in trend following mode with the balance of the trade which is now up over 20%. We alerted Audiocodes Ltd. (AUDC) as a new long position @ $11.77 on 1/10 on a breakout off of a double bottom base pattern. We alerted to take partial profits on 1/16 for gains of nearly 9% and again on 1/24, due to the companies pending earnings release on the morning of 1/28, for gains of nearly 10%. This leaves our traders with 1/3 of their original position in trend following mode with a stop at breakeven on the remainder of their shares. Our initial profit targets are still somewhat conservative due to the current nature of the markets, as caution is still warranted despite the follow thru confirmation on 1/4. 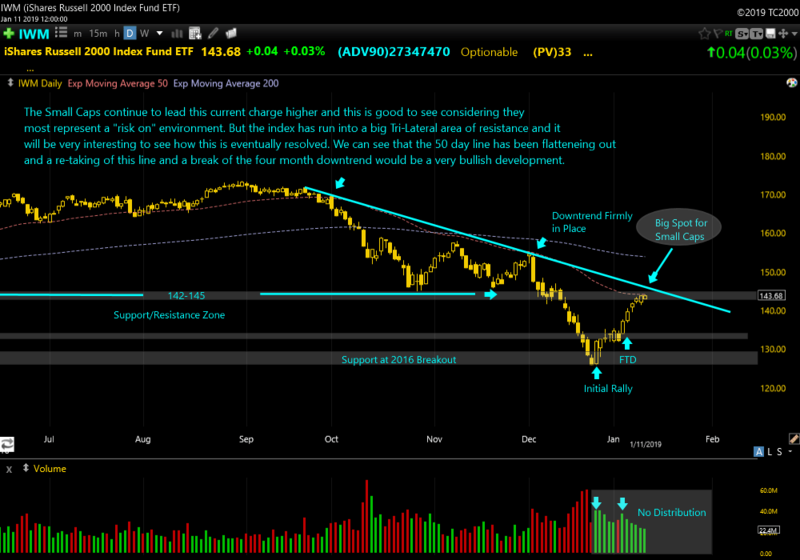 Here is the MarketSmith chart complete with my notes. To take advantage of our premium service visit http://www.ttptrading.com for a free 30 day trial. AJRD- Aerojet Rocketdyne comes from the Aerospace and Defense sector which currently ranks 59th out of 197 industry groups in six month price performance. The stock has posted tripled digit earnings growth in 4 out of the last 6 quarters and sports a high relative strength rating of 94 which is entering new high territory, a bullish sign. In the late fall the stock tried to breakout of a sharp cup pattern after gapping up on earnings, but like many stocks quickly succumbed to nasty market conditions. It since has formed another quick base, this time a double bottom base, and is nearing a pivot point of $37.48. Some inconsistent earnings over the last few years has kept it EPS rating a bit lower than we like to see (69), but the recent surge in quarterly earnings puts this one on the radar. LHCG- Medical Care provider LHC Group formed a relatively loose cup and handle pattern in the late fall, and subsequently broke out, but that attempt quickly failed returning the stock back into the previous base. It has immediately formed a second cup pattern and is working its way up the right side of that base pattern. The company has posted three straight quarters of accelerating earnings growth, and has also posted sales growth of 95% and 88% over the past two quarters. The stock has a composite IBD rating of 99 which is ranked 1st in its industry group, Medical/Outpatient Home Care. Its high relative strength of 97 is also approaching new high ground, a bullish sign. Add this stock back to your long watchlist. OVERVIEW- Momentum continued off of last Fridays confirmed follow thru this week led by the Small Cap Russell 2000 which added nearly 4.75%. 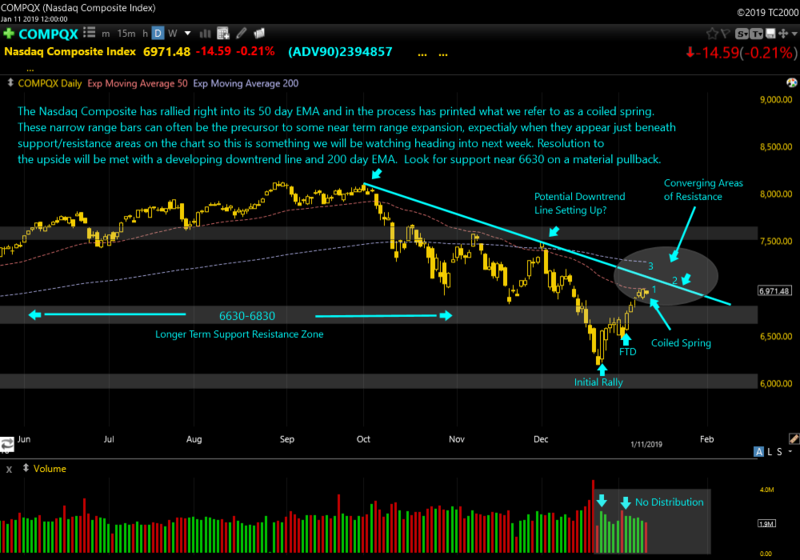 However, the possible areas of resistance on all the indices that we discussed last week have quickly come into play. As usual, the market landscape is painted in varying shades of gray. Last weeks follow thru day, which was our signal to start looking to some market leaders for some possible long exposure, is now met with several technical challenges. Furthermore, immediately upon last weeks follow thru, few leading stocks were breaking out of well formed bases indicating that there is still some work to be done before any new uptrend can sprout serious legs. As the week wore on, a few more opportunities were appearing leaving us with a slightly more positive tone heading into next week, however, some caution is still warranted. Despite the newly confirmed uptrend signal, we must at least consider that this currently rally may be a sharp retracement in a bear market, so any new long exposure taken based on our signal should be taken slowly and with lowered than normal risk. If we are indeed in the early stages of a new lasting bull leg, many more opportunities will present themselves as we move forward. 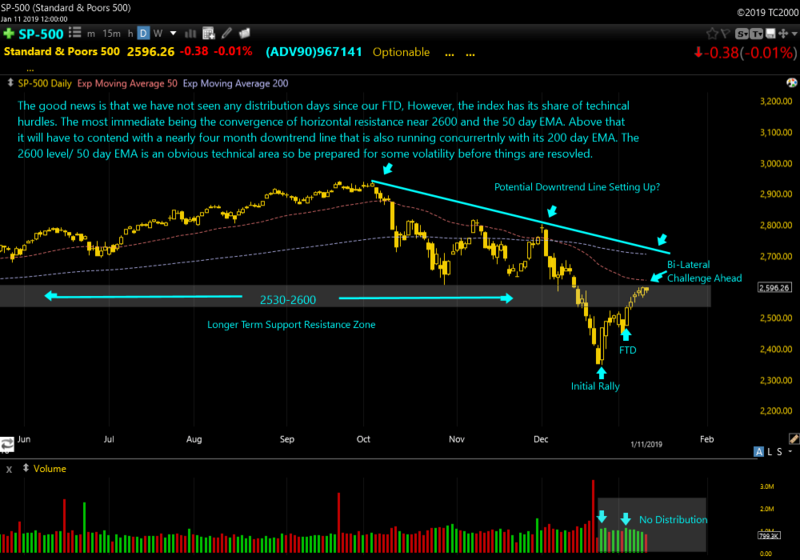 As we point out in the chart reviews below, the indices are all approaching some obvious areas of resistance, unfortunately what seems obvious in the markets can often be dangerous. I believe it was Linda Bradford-Raschke that stated “markets will often do the most obvious thing in the most unobvious way.” In other words, markets will often frustrate the majority of traders and inflict as much pain as possible before they move in their intended direction. So what do we do? We continue our process of monitoring the indices daily looking for clues as to whether institutional traders are accumulating or distributing stock, but in doing so we can not get so fixated on daily index action that we are not paying attention to what individual leading stocks are telling us as they, along with the stocks in our portfolio, are always the ultimate barometer for our trading. Now, let’s take a run thru the charts where we will see that there have been no distribution days tallied since our confirmed uptrend began on 1/4, which is a positive as we head into trading next week. That’s all for today. We will be back tomorrow with our complete Weekend Trading Review for our premium members. Sign up for a free trial today at http://www.ttptrading.com See you there! Emotional trading leads to bias trading, and bias trading leads to an eventual destruction of your trading account. Trust me, I learned the hard way. After trading extremely well part time for many years, I decided to turn things up a bit in 2007 by trading full time and had a pretty good year returning about 41% on my portfolio. In 2008 we had a new president and as the year progressed I become worried that the new administration would wreak havoc on the markets with some new policy initiatives and I steadily built a very bearish bias. Rather than execute my game plan, listen to what the index action was telling me on a daily basis and letting the price action, especially that of leading stocks dictate my trading, I saw a short set ups in most every pattern that came across my screen, and while I profited for a while on the short side, my bias toward a sinking economy under the new administration at that time, left me ill prepared for the possibility of a huge turn in the markets. Well if you are any kind of student of the markets, or at least conscious, you may not have to guess as to what happened to my performance. The market bottomed in early 2009 and rallied around 80% through the end of 2010, not a good time to be on the sidelines, or firing off a whole lot of short trades. The year 2019 brings us yet more political noise and I advise you to stop trying to guess what effects this will have on the markets. Those who had a bearish opinion as a result of the Trump victory in late 2016 felt the pain of being on the wrong side of the market. What will the political winds bring us in 2019? No one really knows, and if you come across someone who insist he does, run away quickly! Stick to your methodology and execute your trading plan. Pay attention to the major indices on a daily and weekly basis, and most importantly, focus your attention on market leading stocks and sectors and listen to what they are telling you always bringing with you a clear and open mind to the markets everyday, and dare I say, Trust The Process! Large cap Biotech tech stocks are in the midst of trying to recover from a nearly 30% decline after topping out in early October of 2018. A Fibonacci retracement grid shows that the large cap biotech ETF, IBB, has recouped over half of those losses with its recent, sharp rally. Rallies can often stall and reverse at key Fibonacci levels between 61.8% and 78.6% so the group may still be vulnerable. However, action in the individual stocks should always be your leading indicator and several large, as well as small cap stocks in the group, have been acting better recently. 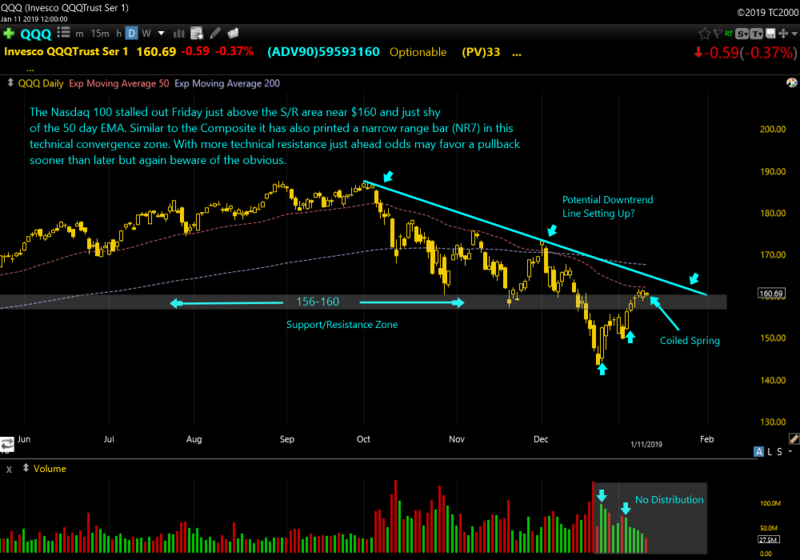 Add $VRTX to your watchlist of solid earners setting up potentially solid base formations. Premium members were alerted to two new long trades today. Growth stock candidates QuinStreet (QNST) and AudioCodes (AUDC) both sport high relative strength ratings of 98 and have posted several quarters of robust earnings and sales growth. Both stocks are ranked #1 within their respective industry groups based on IBD composite ratings. If you would like to learn more and trade using the CANSLIM methodology join us at http://www.ttptrading.com today. A free 30 trial is waiting. See you there!